The ascendant is at about 19 Aquarius, therefore the chart is ruled by Uranus (shocks and surprises). The irony of the ascendant, which is rather fitting at first glance because it exemplifies the negative shock of the event, is that Kennedy was probably the most Aquarian President since Lincoln (also assassinated) or even the Founding Fathers. Here he, or the assassination itself, seems to be represented in two ways: a very personal first house pointing to a shock and disruption to the Aquarian President Kennedy, and secondly, the negative side of Aquarius personified by the group who killed him, OPPOSITE the Leo descendant. The closest approximation to kingship (Leo) that we have in the U.S. is the Presidency. (Obviously, if Kennedy is represented as the Aquarius ascendant, the descendant in Leo represents the 'old' interests who wanted to keep the status quo by killing him. Amazingly, the other in the chart can also be shown as Kennedy, or the Kennedys, if you prefer.) Briefly, the Midheaven and I.C. by themselves are not overly critical to the chart interpretation, in my opinion, although Kennedy’s natal Sun is conjunct within about four degrees of the I.C. in the assassination chart in its fourth house. Then again, the Midheaven is of utmost importance when taken in the context of the entire chart (covered under the Sun section). What led to my astrological study of the Kennedy assassination chart is the luminaries. Incredibly, the Sun is in the anaretic degree of Scorpio and the disk is as close to the Scorpio/Sagittarius cusp as it can be without part of it actually being in Sagittarius and therefore in my opinion not on the cusp. This is Scorpio’s critical degree and the Sun displays its most extreme attributes and stands out in the chart (source: http://en.wikipedia.org/wiki/Anaretic_degree). The Scorpio Sun is also unaspected in the chart, taking on a further dominant position in the chart (source: many various sources, e.g. Noel Tyl). The overshadowing influence of the Sun in Scorpio possibly might be mitigated by a weak conjunction with Mercury (slightly over a ten degree orb) and conjunctions with Vesta and Ceres (not planets, and about equally weak conjunctions). The secretive, destructive force of the Scorpio Sun is conjunct the Midheaven at about 4 Sagittarius, which shows a negative influence impending on the public life/tenth house in the chart, which can be interpreted as the Presidency without much of a stretch, especially the Kennedy Presidency of higher ideals (Sagittarius). The Scorpio Sun disposits to Pluto, indicating an underworld or secretive influence in the assassination events. Also very noteworthy is the fixed stars connection. The Scorpio Sun bears a very strong opposition to 29 Taurus, containing the Pleiades cluster (the Pleiades’ degree is referred to by Celeste Teal as the weeping degree and according to her associated with violent death). The Scorpio Sun is also in opposition, in 1963, about a four degree orb, to the malevolent fixed star Caput Algol, referred to as the Demon Star and associated with murder (source: http://www.astrologycom.com/fixedstars.html). The core of this transit chart is the destructive (or better said, negatively influenced) Scorpio Sun. The Aquarius Moon is conjunct Saturn and in the twelfth house. It disposits to Uranus and very clearly represents the symbolic emotional shock of the event to the entire world, as well as being broadcast to the world after the event and even being recorded on film (by ordinary citizens, no less). The Moon and retrograde Jupiter are part of a strong Yod pointing to the chart’s ruler, Uranus. The Moon in the twelfth, especially conjunct the ascendant, is a strong indication of an ending (in this case, ending Kennedy’s Presidency). The luminaries in the chart add a great deal of tension to the chart and the Moon also points to an underworld connection via the twelfth house and opposition to the descendant (Presidency/old guard). The underworld connection is more of an eighth house phenomenon, although it also fits the twelfth (something unseen) and is especially apropos considering how much grief the events caused to Americans (twelfth house source: Moses Siregar). The Moon also forms the quincunx aspect to Pluto, although not very strongly (about two degrees and fifty minutes). In 1963 the Moon was very strongly conjunct with the fixed star Albali, according to George Noonan a star of mixed fortunes, sometimes associated with danger and death. The mixed fortune aspect, however, is appropriate and expected for the wild-card ruler of Aquarius, which promises shocks and surprises, good or bad. The Moon is the focal point of a slanted kite pattern in the chart which also adds to its importance in the chart. Moon in Aquarius is humanitarian, but also takes on a cooler side due to its air quality (thought as opposed to emotion). So the Moon working through the darker side of Aquarius symbolizes a group, most likely, behind a cold-blooded murder. The subconscious force behind this transit chart is the shocking Aquarius Moon. Mercury is in its detriment in Sagittarius and strongly squares its higher octave Uranus. Most overtly, it seems to represent a breakdown in the thought and communication, whether by accident or by plan, in the people assigned to protect the President. It also aspects the Midheaven within a reasonable orb. Because Mercury is a neutral planet and tends to take on the characteristics of the nearest planet, it has an intense Scorpio secondary characteristic, so to speak, due to its loose conjunction to the Sun. It’s also very close to Black Lilith, so Mercury suggests efficient thought and communication that day overshadowed (and burned, so to speak, via its proximity) by the Scorpio Sun and thought and communication also very close to the dark forces operating that day (Black Lilith). Three very personal planets, namely, Mercury, Venus, and Mars, were in Sagittarius that day. The only retrograde planet in the chart is Jupiter. Venus is basically alone in the chart except for a very tight conjunction. The most noticeable characteristic of Venus is that it’s not very noticeable. Perhaps it is restricted by Saturn via a sextile, although the orb is rather wide (over four degrees) and the sextile is not a strong aspect to begin with. Mars definitely overshadows Venus, with the fiery Mars in the fiery sign of Sagittarius, although Mars is much better in Aries. Mars is in its accidental exaltation (if you accept Capricorn as Mars’ exaltation), while Venus is not awful in Capricorn/the tenth house but not overly strong either. The Venus-Mars pair symbolizes JFK (Mars) and the first lady Jackie Kennedy (Venus) quite well, literally, in public (tenth house) fire (Sagittarius). Black Lilith is within shouting distance of the Venus-Mars conjunction and approximately at the midpoint of the Scorpio Sun and Venus or Mars. Acting out the shadow (Lilith) can be accomplished through openly killing (Sun in Scorpio) the man (Mars) beside his wife (Venus). Mars takes on almost no more importance than Venus in the chart, at first glance. Perhaps it is only second in importance to the Sun, which in my opinion disposits to Pluto but traditionally disposits to Mars. Mars is mutually receptive to Jupiter in Aries. Jupiter is also very important and obviously, discussed below. Every item in the chart; point, planet, and everything else; disposits to the Mars-Jupiter duo. Mars and Jupiter are in mutual reception and do not aspect, unless one allows an almost eleven degree orb for a trine between the two. Mars symbolizes use of energy. It can also be violent. Jupiter expands the violent masculine energy of Mars used to attack Kennedy. Arguably, if Mars is in its accidental exaltation, it uses every bit of the utilitarian, determined Capricorn strength to carry out its goal. Mars in the tenth also refers to the public violence used against Kennedy in his public life as the President. In addition to the mutual reception with Mars, Jupiter is the only retrograde planet in the chart. The retrograde quality gives Jupiter a more Saturnine quality (source: Understanding Retrogrades by Helen J. Adams). Jupiter operating through Aries can also manifest as violence, especially so closely linked to Mars in the chart. Jupiter points to Uranus in the Yod configuration [violent (Aries) emotional (Moon) shock (Uranus)]. Jupiter is also an important part of the lopsided kite configuration, with a heavy karmic quality expanding Mercury’s ineptness (in this instance) via a very strong trine. Jupiter magnifies the shock of the event by strong associations with Aquarius: it aspects Uranus, and Moon in Aquarius. Saturn is in its classical dignity and conjunction within about two degrees of the ascendant. It disposits (in my opinion) to the chart’s ruler, Uranus. Saturn is the great malefic, reasonably powerful simply by sign and amplified by the conjunction to the ascendant. Again, the dual interpretation of the magnetic axis is very insightful: the Aquarian Kennedy (19 Aquarius ascendant) meets the limits and karma of his own life and administration and is gunned down by the old establishment (Leo descendant); and the Saturn opposition President (19 Leo) is killed by an unpredictable crowd with an overriding interest in getting rid of him. The Saturn placement at the end of the twelfth house also signifies a sad end to the Kennedy Presidency. Facing the consequences of becoming such a powerful man who opposed the status quo. Uranus even aspects the karmic axis, if one cares to extend the analysis in that direction. Neptune is very symbolic in the chart. Neptune’s placement killed the Camelot image of the White House in two ways. Neptune was the fantasy and operating through Scorpio, was the end of the fantasy that day. Neptune was also in the ninth house, so the higher ideals (Sagittarius/ninth house) of the Kennedy administration also were ended that day. Neptune was not well aspected; it fell under the powerful Scorpio Sun’s rays and squared both the Moon and Saturn. Its connection to Pluto was also strong, due to the Neptune-Pluto sextile and the dispositorship. Neptune also trined Chiron in Pisces. The underworld (Pluto) killed (Scorpio/Pluto) Kennedy’s and society’s dreams (Neptune). The ending (Pisces) caused great pain (Chiron). Neptune is also heavily involved with the Moon's nodes, and forms a trapezoid figure if the sextiles are stretched a bit. Neptune also refers to the religious overtones of the 1960 Presidential campaign and Kennedy’s Catholicism. Although he didn’t swear much by his religion, the Neptune symbol definitely stands out mightily as the death (Scorpio) of a Catholic President. Also, consider the symbolism of the Aquarian President brought down by those who wanted things to stay the same (Age of Pisces/Neptune). I would say that Pluto is outside of the proper orb for using it with the Vertex, but in this extraordinary event, I will accept an orb of two and a half degrees. Pluto is square Black Lilith, a most ugly combination. It also squares Mars and Venus, as well as the third personal planet, Mercury. Seems to address the breakdown in security (lack of thought and communication, lack of action, lack of cooperation) in Dallas that day. Pluto in the earthy Virgo sign again refers to, garishly, the death of the President’s body. The strongest points of Pluto seem to be the fact that it’s one of the major planets in the chart, due to Scorpio Sun dispositing to Pluto, and its conjunction to the ruler, Uranus. Quite astounding that the luminaries and ascendant disposit to two outer planets in the same sign and only five degrees apart. A shocking end emanating from the feminine Virgo sign; Kennedy’s service and dedication brought to an abrupt end. Chiron portended the pain that Kennedy himself, and arguably those in his immediate family, would feel from the assassination, due to the first house placement. Chiron is the only planet/asteroid in the first house and also the only celestial object in Pisces. Pisces is Chiron’s detriment (source: Martin Lass, who suggests Virgo as the dominion of Chiron if not outright saying so) and is heavily significant in the chart. The Pisces sign indicates sadness stemming from the illusions/fantasies of the Kennedy White House, and the pain of the masses learning of his death. The tension (opposition aspect) with Uranus also indicates a painful (Chiron) shock (Uranus). Chiron is also definitely opposite Pluto, which signifies pain (Chiron) associated with death (Pluto). Chiron is also important in the yod configuration. The yod points to Uranus (shock) ultimately culminating in spiritual woundedness (Chiron in Pisces). The Catholic (Pisces) President leaves (opposition Vertex) earth (Virgo). Pallas is in Scorpio in the eighth house. The double Scorpio influence strongly indicates an end to the creative intelligence of the youthful Kennedy administration. Juno is in Scorpio in the ninth house. Juno is about relatedness, so seems to refer to the end of the relationship to Jackie, but more abstractly indicates the end of the relationship with the American people and the end of the Sagittarian journey that Kennedy pursued with his new, lofty ideas. Ceres represents unconditional loving; although it would seem to be at least somewhat weak in Scorpio, it’s also in the ninth house and the closest asteroid to Neptune. Another reference to suddenly being taken away from his wife, and the country he must have loved enough to be President of. Also an end to the ideals and dreams (Neptune) he was so fond of. Vesta is the only asteroid lady not in Scorpio, but it is combust due to its proximity to the Scorpio Sun. A loss of focus and commitment to death. The asteroid ladies seem to be indicating that the new energies that JFK brought to the Presidency were abruptly cut off by the old guard, mostly via the secretive, destructive plot characteristic of the dark side of Scorpio. Simply stated, the Vertex describes what happened at two levels. Literally, the shock that ended the President’s life (Pluto and Uranus conjunct the Vertex) and the pain it brought him and his immediate family (Chiron opposite ascendant). It also indicates the reentry of the old forces and underworld back into the White House due to the shocking event and pain and loss of faith the entire United States went through. The nodes form a mystic rectangle with Chiron and the Vertex. This leads to a very esoteric interpretation. Perhaps it was simply Kennedy’s time to move on - even though his death was most certainly unfair by almost anyone’s standards. A completed mission; the United States not ready for this type of leader, but having a taste of the new Aquarius type leadership. Uranus is also a part of the mystic rectangle (making the pattern a double mystic rectangle). Another indicator of the Aquarius leadership. A President ahead of his time (the Saturn/Uranus tug of war). The nodes also have intriguing signs and houses. The comfortable, familiar, natural leadership (South node) of the young President (Capricorn) towards humanitarianism and demystifying the Presidency (11th house). The future direction of the country (North node in Cancer) towards keeping the elite in power (fifth house). Lot of fortune is very well placed in the chart, for most readings. In this instance it may be a bit too good, representing the greed (worse side of Taurus) of those involved in killing Kennedy, and also the vast wealth that Kennedy himself and his family possessed (second house). Hopefully the reader is at least somewhat convinced of the powerful transits that created the conditions for the successful assassination of President Kennedy. 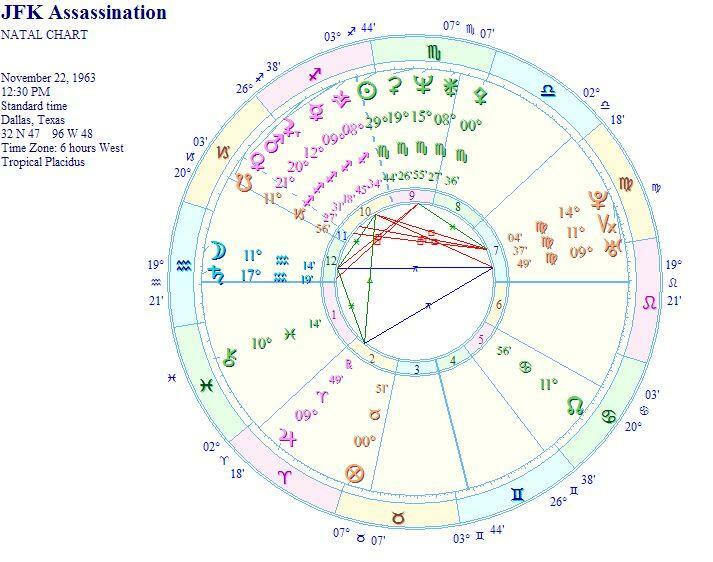 The United States birth chart and a Sabian symbol analysis also shed light on the assassination event. The "great eight" added to the analysis refines the insights presented by the classical planets. Hades is undeniably the most influential of the Transneptunians. This is very consistent with the underground, malefic influence of Hades. Not all of the Transneptunians appear to have a direct influence, although they can be analyzed by house and sign, as in the case of Zeus. Author uses a one-degree orb for the Transneptunians which limits the amount of aspects but makes the aspects present much more significant. Pluto forms a strong semi-sextile aspect to Cupido. The Sun is at the end of Pluto's sign, drawing attention to Pluto. Pluto (destruction) and Cupido (society) aspecting reiterate the theme of some kind of abrupt rift in society caused by the assassination event. It also suggests some kind of underworld clan acting to kill the President, or if Oswald truly acted alone, the fact that Oswald was part of some kind of destructive "family". Hades symbolizes muck, waste, garbage, decay, underworld influences, and in author's opinion, wealth. Hades is very prominent in the event chart, in an uncanny manner. Hades' influence is expected in an earth-shaking assassination event. Hades is part of a kite pattern with a grand earth trine and North node in Cancer as the focal point of the kite formation. Hades retrograde at 11 Taurus acts as part of a circuit of repeating, easily flowing earth energy with Vertex at 11 Virgo and South node at 11 Capricorn. Hades' very malefic influence, in this case, is brought into manifestation in the form of an event via the Vertex and again the theme of planning via organization is broached with South node in Capricorn. It also shows an evil event (Hades/Vertex) that describes an act that determines a President's fate (Vertex) in the context of Kennedy's past direction in executive office (South node in Capricorn). North node in Cancer is the outlet for the grand trine energy. A very emotional (water sign) event for the United States (Cancer) and altering the future of the country (North node). The United States must continue forward (focal point of the kite) despite the horrific event. Hades aspecting Black Lilith is a one-two punch. Lilith symbolizes the shooter(s) acting out the dark side of the personality, and Lilith touching Hades by aspect gives the impression of the two feeding off of each other and the connection of muck combining with the darker side of human nature. Perhaps the most startling and obvious aspect Hades makes is the square to Moon in Uranus. The tense square with Moon in Uranus' sign suggests a warped intricate plan to commit a shocking (Aquarius) deadly (Hades) event that caused negative emotions (Moon-Hades) to well up in an entire nation. It was very disruptive and tragic. The Moon-Hades connection suggests an associative criminal effort to create and implement a plan to kill the President. Zeus literally symbolizes firearms and military-like efforts. Zeus is unaspected, which calls attention to his importance in the chart. Zeus is in Virgo, significant even though he takes many years to transit a sign. Very precise firearms and marksmanship (Zeus in Virgo) was required to kill Kennedy. The seventh house, the house of partnerships, indicates at least two ideas at work: first, that "the other" was acting against Kennedy that day using precise weaponry, and second, that collaborative efforts (seventh house) were used to kill Kennedy that day. The role of Kronos appears to be the tension he provides in the chart by his placement in the third house and almost exactly one degree from the Imum Coeli. It shows that the highest authority (Kronos), the President, was at odds with being in public that day (Kronos opposite Midheaven). Otherwise Kronos is not influential in the chart. Apollon is very close to sextiling the Sun with a one degree, four minute orb. Based on the Sun as the core of the chart, perhaps the aspect could be slightly stretched. Apollon is a multiplier, and normally a benefic point. With Sun in the anaretic degree of Scorpio, Apollon's main influence appeared to be to magnify the Sun's influence in the event. Apollon was also strongly aspecting Admetos, and perhaps Admetos served to slow down or reverse Apollon's influence to some extent. Admetos only aspects Apollon. Admetos' influence has appeared over and over in the subsequent years of the assassination event. A poignant example of this is the assassination film played any number of times slowed down. The analysis of the event in an attempt to unearth what really happened has resulted in the event being analyzed over and over and slowed down so it could be examined in a series of steps. Harmonics uncover Vulcanus lending his energy to the event. He forms a quintile to Pluto and a septile to Cupido. Pluto and Cupido are in semi-sextile aspect and the three exchange energies on that day in an oddly shaped triangle pattern. Pluto is destructive and Vulcanus is very powerful. Cupido refers to a clan or familial group. Again, it suggests an underworld, very powerful, organized influence acting to assassinate the President. Poseidon aspects both Saturn and Neptune. Generally speaking, the nature of Saturn and Neptune interacting with Poseidon indicates sadness and loss associated with the President's death. It was also a very karmic and spiritual event, albeit in a negative way, for the country.